If you are a small farmer, buying pre-made seed starting mix can get a bit pricey. You want quality seeding mix, but you don't want to spend a fortune. That's why many small farmers do not buy pre-made seeding mix. If you can buy the basic ingredients in bulk, it's easy to make your own seed starting mix and not spend too much money on it. The best part is that you can tell exactly what is going into your seed starting mix, which is ideal if you are an organic farmer. Why Make Your Own Seed Starting Mix? It can be much easier to buy large amounts of the basic ingredients for seed starting mix, compared to buying it already made. And you can use your own compost to make seed mix--just screen it first by passing it through a framed screen fitted over a wheelbarrow or other large container to sift out large particles, rocks or other foreign material. If you are composting on your farm, this can save a ton of money. It can also reduce the amount of dust that's released into the air, making it less messy. The other main reason small farmers choose to make their own seed starting mix is the same reason they start from seed: to have control over the mix and ultimately, their food. 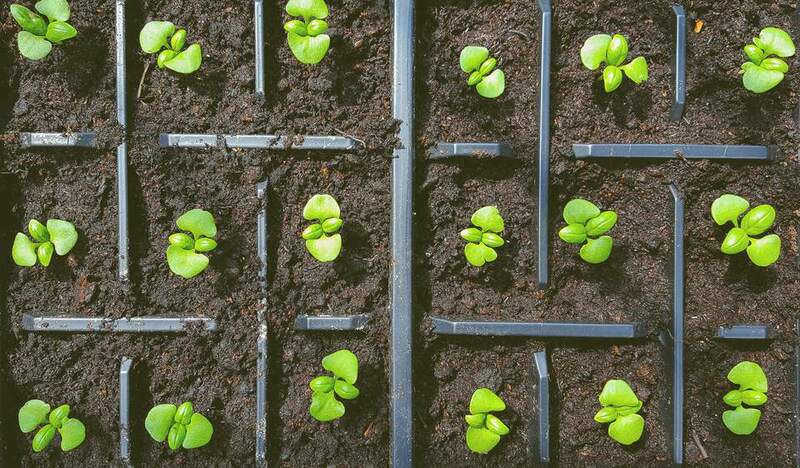 For a seed starting mix, you may eventually want to customize the blend to meet your requirements, whether you're using plastic celled trays or making soil blocks. That's something you cannot do when you buy a pre-made mix, so it gives you good control over what is going into growing your crops. This is a basic recipe for an indoor seed-starting mix that can be further customized and built upon. Lightly moisten ingredients with a fine water mist, then blend thoroughly in a large container such as a wheelbarrow. If making your own mix, aim for something that has a balance of being able to stay moist yet can drain well. If seedlings are too wet, they may suffer from damping-off, a fungal disease that causes them to wither where the stem meets the soil. With that, the seedlings eventually fall over and die. If you need a mix that drains more easily use less compost and more peat moss or perlite. If you are looking for a mix that holds more water, add proportionally more compost or vermiculite. If you don't use compost in your mix at all, add a quarter teaspoon of lime for every gallon of mix.